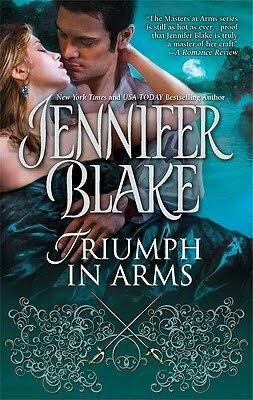 This week on Excerpt Thursday we're so tickled to have Jennifer Blake with us as she spreads the word about her February MIRA release, TRIUMPH IN ARMS, set in mid-19th century New Orleans. This is the sixth installment in her Maître d'Armes series. Join us Sunday when Jennifer will be here to answer questions and talk about her work. You'll also have the opportunity to win a signed copy of TRIUMPH IN ARMS! The dashing Maîtres D'armes of New Orleans are renowned for their swordsmanship--and their relentless pursuit of their desires! Once a starveling bootblack, Christien Lenoir has risen to become the sword master known as faucon, the Falcon. When a desperate gambler stakes his plantation in a late-night card game, sharp-eyed Christien antes up. For he wants River's Edge--and the tempestuous widow whose birthright it is. And he will stop at nothing to have both. Reine Cassard Pingre feels trapped: the only way to keep her beloved home--and her inheritance--is to accept Christien's bold proposal of marriage. Though she instantly despises him, and despite rumors that she had a hand in her husband's mysterious death, Reine cannot dissuade him from wedding...and bedding...her. Their union is electrifying, but the honeymoon may be cut short by the lurid secrets at the heart of River's Edge. The wail came again, thin, high-pitched, ringing down the hallway outside his bedchamber. Snatching open his sword case on the bedside table, Christien hefted one of the matched blades. He strode to the door, pulled it wide and moved into the long, dark corridor. Something small and white wavered in the dimness. Abruptly, it sprang toward him. It was little Marguerite, flinging herself against him, clinging to his legs in wild terror. She shook with sobs between the keening cries, almost too high for human ears, which whistled in her throat. Down the hall, a door flew open. Light streamed out, a long beam that came closer. Christien turned toward it with his sword in his fist and his free hand holding the child against his side. Reine stood in the doorway with the lamp held high. Its light spilled over her, catching with blue and orange fire in the shimmering tresses that tumbled around her shoulders, casting mysterious shadows down the white batiste fullness of her nightgown. She stood as still as a statue for an instant, her wide gaze brushing over his bare shoulders, his set features, the sword he held in readiness. Directly across from where he stood, another door swung wide. A moan came from the dark interior of the room. "Angel of Death! I knew it, I knew it! He's come, come at last. Angel of Death, come for me. I said it, I knew him, I told you, didn't I? I knew it, I knew..."
The anguished and near incoherent muttering grew louder as Madame Cassard staggered into the hall. Her eyes were wide and she clutched a rosary of ivory beads in her hand. She stared at Christien in the dim glow from her daughter's lamp, her features slack and eyes wide as her voice dropped to a whisper. The trembling in the child grew more violent. Her keening rose once more to a scream that was stifled only as she buried her face against Christien's thigh. She clutched him with the strength of desperation in her small hands. Ignoring the others, he sank to his heels beside her. He drew her to him, folding her to his chest with his sword still in his hand. "I've got you," he said into her hair as he rocked her. "You're safe now. Hush, ma petite, don't cry. "The loup-garou will never get you, I won't let it. It's gone and I have you now." Marguerite hiccuped and circled his neck with a small arm, hugging him close. She rested her head on his shoulder, heaved a sigh and was silent. Reine Pingre moved then, coming toward them in a spreading circle of lamplight that cast her moving shadow over the walls, appearing half avenging goddess, half Madonna. Tears stood in her eyes and her features were blank with the force of her relief. Kneeling beside the two of them in a billow of fine, white fabric, she placed the lamp on the floor then touched her daughter's fair hair, smoothing it gently. "She will be all right, I think," Christien said in low tones. "I believe so." Reine lifted her lashes, meeting Christien's gaze while stark gratitude shone in the pure blue of her eyes. "And because of it, you have won River's Edge in truth, Christien Lenoir. If you can keep her safe, keep us all safe, then I will marry you."